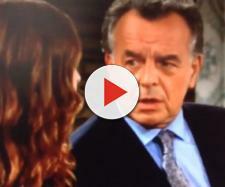 Victor’s daughter is embarrassed and outraged to learn of his open marriage. On Friday’s episode (June 1) of “The Young and the Restless,” Abby Newman received shocking news from her stepmother because Nikki decided it was time to come clean about her relationship with Arturo. Abby was pretty dismayed to find out the man she is falling for has been to bed with her father’s wife. She was outraged and embarrassed when she heard that Victor was aware of his spouse’s activities and could not belie her dad also was cheating. Upon hearing that her father and step mom had an open marriage, young Ms. Newman was completely blown away. She told it all to Ashley, but Abby must decide for herself if Arturo will go or stay. When Nikki sent her boy toy packing, she asked Victor to allow Arturo to continue working for Nick. Neither of the Newman’s had any idea of the twist of fate that was coming their way. Abby asked Arturo to help her find Jack when he was missing and later invited him out of town with her. Nothing big happened between the duo, but upon their return to Genoa City, Nikki saw them kissing. She then gave Abby the details regarding her open marriage with Victor and this caused her stepdaughter to have the shock of her life. Although Victor has agreed that Arturo can keep his job, he will not want this man sleeping with a second woman in his family, namely his daughter. Should the Newman patriarch find out, he might pay off the contractor to leave town and/or forbid his youngest child from seeing him again. It could be that Abby herself will end things before they go too far. However it goes down, Arturo’s days are numbered in Genoa City. Nick really does not want him around because he slept with Nikki, and Victor is keeping an eye on him, just waiting for one wrong move. Nikki herself is now uncomfortable because of her former lover's budding relationship with Abby. Ashley also will be guarded because her daughter confided the sordid details of Victor and Nikki’s arrangement. She may even advise Abby to end things before she gets hurt. The bottom line is that Arturo is from the wrong sid of the tracks and will never fit inside the world of Newmans and Abbotts. He is an outsider who will only be tolerated for a season. Abby has gone through men the way some women change clothes. Her marriage to Stitch did not work out and neither did her relationships with Zack and Scott. This flirtation with her stepmom’s former lover is not going to last either. Stay tuned to “The Young and Restless” weekday afternoons at 12:30 PM ET on CBS.